U.S. sales of the F-Series pickup slid 8.9 percent last month. It is Ford's top-selling line and most profitable vehicle. 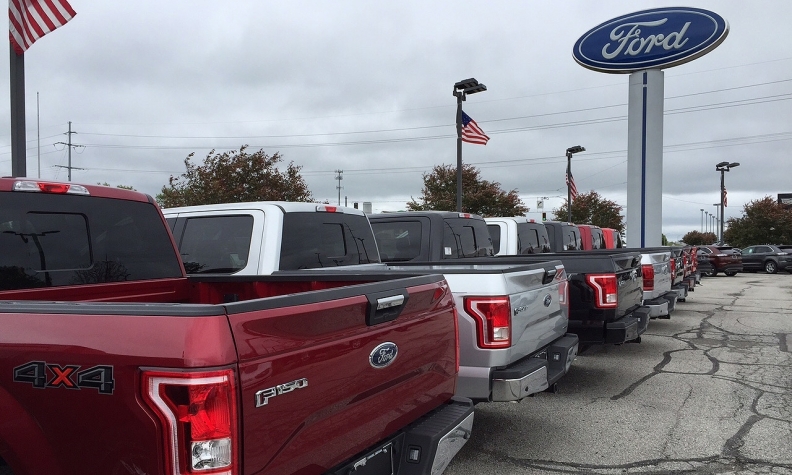 DETROIT -- Ford Motor Co. has begun offering discounts that can exceed $10,000 on its new aluminum-bodied F-150 pickup, which has been losing sales and market share this year as the automaker works to build inventory on dealer lots. The company's website offers "up to $10,029 in total savings" on a 2015 F-150 XLT SuperCab 4X4 with the luxury chrome or sport package in some U.S. regions. That model comes with a discount of $7,050 in other areas, according to Ford.com. U.S. sales slid 8.9 percent last month for Ford's F-Series pickups, its top-selling line and most profitable vehicles. The truck's share of the big pickup market fell to 28 percent in June from 33 percent a year earlier, according to Autodata Corp.
Ford blamed tight inventory caused by the conversion of two plants to build the trucks, the first mass-market vehicles to use lightweight aluminum so extensively. Improving inventory of F-150 is allowing Ford to offer more competitive incentives as part of its Summer Sales Event promotion, Erich Merkle, the company’s sales analyst, said Wednesday. He said overall incentive spending is down from a year ago and that the truck is selling for $44,100 on average, the highest transaction price in the segment. Ford cut spending on marketing promotions per vehicle 16 percent in the year's first half to an average $2,736, according to Autodata. Average incentives rose slightly at General Motors to $3,427 and Fiat Chrysler Automobiles NV to $3,277 during the same period, Autodata found. Ford has been converting its two F-150 factories to make the aluminum truck for 18 months, making it “the slowest and most complex changeover in recent history,” said Jeff Schuster, an analyst at consultant LMC Automotive in Southfield, Mich.
Ford has said it had only half its normal inventory of the F-150 on dealer lots in June and won't have a full supply until the end of September. The company has also been hampered by a shortage of frames for the redesigned truck. U.S. sales of the F series fell 2.4 percent in the first half and have dented Ford's earnings. The trucks were the top-selling vehicle line in the U.S. for the 33rd straight year in 2014. The new F-150's fuel economy increased as much as 29 percent, primarily because the use of aluminum trimmed the truck's weight by about 700 pounds (318 kilograms). Some dealers began advertising discounts of $10,000 to $11,000 off the new F-150 in June, Automotive News reported on July 1. Asked about the dealer ads touting $10,000 discounts on F-150, Ford's top U.S. sales executive said the incentives were being offered by individual dealers. "I can tell you that that number of $10,000 is commonly used by our competition," said Mark LaNeve, vice president of U.S. marketing, sales and service. "So you've probably seen a competitive response by a given individual dealer." Sales of GM's Chevrolet Silverado truck jumped 18 percent last month, as its share of the full-size pickup market grew two points to 25.9 percent. Sales rose 0.6 percent for Fiat Chrysler's Ram pickup and gained 4.3 percent in the first half.